This is essay is a stub. I would welcome comments and further information from any reader who knows about these families. Two Comerford families lived in the neighbouring north Co Dublin fishing towns of Balbriggan and Skerries in the 18th and 19th centuries. I have no information about their origins, or whether they were related to each other. 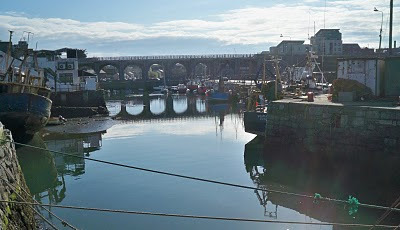 In Balbriggan, the Comerford family was closely identified with the cotton industry, founded by the Hamilton family, while the Comerfords of Skerries, who may have been related to their Balbriggan neighbours, were tenants of the Hamilton family of Holmpatrick, and were closely identified with the boat-building and fishing trades. Balbriggan owes its rise from a small fishing village to a place of manufacturing and commercial importance to George Hamilton. In 1780, he introduced cotton manufacture by building of two large cotton mills, powered by a sophisticated mill race. They were the equal of any contemporary mills in England. The Lower Mill was promoted by George Hamilton of Hampton (ca 1731-1793), Baron of the Exchequer, but was soon sold to Messrs. Comerford and O’Brien. The second mill, the Upper Mill, was supervised by Joseph Smyth and was in production by 1783. JOHN COMERFORD ( -1795), merchant, of The Gibb, Thomas Street, Dublin, was involved in the partnership of Comerford and O'Brien with his prosperous brother-in-law, Denis Thomas O’Brien, a leading member of the Catholic Committee who was closely involved in Dublin political and commercial life at the end of the 18th and beginning of the 19th century. In 1758, John Comerford married Mary O’Brien, younger sister of Denis Thomas O’Brien and youngest daughter of Thomas O’Brien, who was originally from Fairfield, near Ahascragh, Co Galway. Later evidence suggests it is likely the Comerfords had family connections with the McDermotts and the O’Briens had intermarried with McDermotts in Galway. The marriage took place in Saint Audeon’s Roman Catholic Church, High Street, Dublin, on 18 April 1758. Thomas O’Brien was established in business in Dublin as a linen draper by 1737, when he was leasing premises in Usher’s Quay. In 1758, his daughter Mary married John Comerford, and by the early 1760s John Comerford and his brother-in-law, Denis Thomas O’Brien, were in partnership, trading at Usher’s Quay. Denis Thomas O’Brien was Vice President of the Dublin Chamber of Commerce, founded in 1783, and invested £200 in the Bank of Ireland, while John Comerford invested £2,000 in the bank. On 30 March 1766, John Comerford and his brother-in-law Denis Thomas O’Brien were witnesses at the marriage in Saint Audeon’s Church, Dublin, of Sir Balthazar Nihill, Knight of Malta and Brigadier General in the army of the King of Naples, and Alice Woulfe (alias Mary Harold); this washer second marriage, and her first husband had been Nicholas Woulfe of Tiermaclane, Co Clare. She was a sister of Helena Mary Harold who was also a witness. On 7 February 1773, the names John Comerford and Denis Thomas O’Brien appear in a document calling for the establishment of a Chamber of Commerce. Denis Thomas O’Brien also gave evidence to the Irish House of Commons committee concerning legislative union with Great Britain. In the early 1780s, the firm of O’Brien and Comerford bought the Lower Mill, at Balbriggan, Co Dublin. O’Brien and Comerford both appear in the Belfast Newsletter on 12 October 1782 in connection with the linen trade, and had produced printed pattern Volunteer furniture. EDMUND COMERFORD (ca 1759-post 1834). He was born ca1759. On 8 July 1784, Edmund Comerford, married his first cousin, Jane O’Brien (born 1763), daughter of Denis Thomas O’Brien, in Saint Audeon’s Roman Catholic Church. Her mother, Helen Mary (Harold), was the daughter of Richard Harold of Pennywell, Limerick, and a great niece of Sir John Higgins, physician to King Philip V of Spain. The wedding was conducted by Archbishop John Carpenter, and the witnesses were Thomas O’Brien, John Comerford and Thomas Fitzsimons. Jane O’Brien may have been a sister of Marie Adelaide O’Brien (1778-1858), who married James Basterot, son of Bartholomew Basterot, Comte de Basterot, of Duras House, Co Galway. When this couple fell into debt and could no longer may their mortgage on Duras House, it finally passed to Henry Comerford, which may indicate John and Edmund Comerford were directly related to the Comerford family of Galway. Although there are no known children of this marriage, the marriage strengthened the Comerford O’Brien partnership at the time they were expanding in Balbriggan. In 1787, Comerford and O’Brien had a calico and cotton factory at Balbriggan and a warehouse in Merchants’ Quay, Dublin. They were joined by Edward Clarke, who had a textile printing works at Palmerstown, Co Dublin carrying on the business of manufacturing and printing. The mill owned by O’Brien and Comerford at Lower Mill, Balbriggan, was reportedly the sixth largest manufacturing factory in Ireland. This exciting industrial innovation in Balbriggan was described by the Revd William Bruce, who visited Balbriggan on 27 and 28 August 1789, and wrote: “[T]he town which has an appearance of great prosperity, all the machinery in the town belongs to O’Brien and Comerford ...” All was not rosy in this economic boom town of Balbriggan, though. In common with most towns in the Industrial Revolution, child labour was exploited, and Bruce, in his description of the factory belonging to O’Brien and Comerford, mentioned that 100 children were employed there. The Balbriggan firm of O’Brien, Comerford and Clarke opened a warehouse in High Street, Belfast, in 1788 under the direction of William Martin, and for a few years supplies of plain goods from the factory at Balbriggan, and of printed stuffs from the print-field at Palmerstown, Co Dublin, were offered there at “Dublin prices.” This facility for purchasing these products may explain why the only known example of 18th century Irish printed linen and cotton that survives in Belfast, in the Municipal Museum and Art Gallery, is a piece of the firm’s well authenticated “Volunteer Furniture” pattern. The firm soon recovered, and the cotton mills of Balbriggan also recovered from the financial collapse suffered by Comerford and O’Brien, and the firm O’Brien, Comerford and Clarke appears again in the Dublin Directory in 1794. When Theobald Wolfe Tone was about to emigrate to America in 1795, Comerford and O’Brien provided him with bills of exchange payable by a firm in Philadelphia. John Comerford died died that year, in October 1795. Jane O’Brien Comerford of Eccles Street, Dublin, the wife of Edmond Comerford and daughter of Denis Thomas O’Brien, died in 1813, according to a report in the Clare Journal on 3 June 1813. Edmond Comerford was still listed at his house in Eccles Street, Dublin, in 1834. Eventually, the cotton mills in Balbriggan went into decline once again in the 1830s. On 9 July 1798, Marie Adelaide O’Brien, a sister-in-law of Edmund Comerford, a Dublin linen merchant, married a spendthrift French émigré, Jacques (James) de Basterot. only son of Barthelemy Comte de Basterot (died 1788) of Bordeaux and his wife, Frances (Fanny) French, daughter of James French of Duras near Kinvara, Co Galway. Fahey states that Frances French, daughter of James French of Duras or Doorus, married a French gentleman, Bartholomew de Basterot, and subsequently their descendants held lands in Doorus and resided in Doorus Park. James Basterot is listed as a resident proprietor in 1824. James de Basterot is recorded as the proprietor of townlands in the parish of Duras, barony of Kiltartan, in the 1830s. Their only son, Bartholomew or Barthelemy O’Brien de Basterot (1800-1887), was born in Dublin in 1800 and was educated at Stonyhurst. As Bartholomew Comte de Basterot he married Pauline, daughter of Florimond de Fay, Marquis de Latour Maubourg. In the 1870s Count de Basterot owned over 350 acres in Co Galway. Meanwhile, the fishing trade was also important in Balbriggan, and in 1825-1826, Thomas Comerford of Balbriggan was the owner of a boat, the Bee, with a crew of seven. Nevertheless, members of the Comerford family continued to live in Balbriggan and the neighbouring north Co Dublin fishing port of Skerries for a number of generations. In the Tithe Applotment Book for Balbriggan in 1833, we find four members of the Comerford family holding property in High Street, Balbriggan: Simon Comerford, Tho[mas] Comerford, Mich[ae]l Comerford and Jno Comerford. 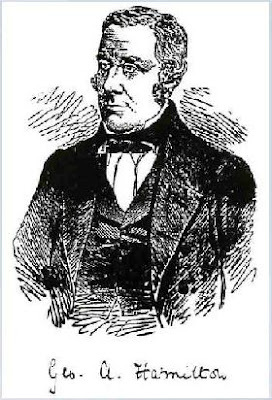 Michael Comerford, of High Street, who was a tenant of George Alexander Hamilton (1801-1871) of Hampton Hall, Balbriggan, holding a house, office and garden. Hamilton, whose grandfather had built the mills in Balbriggan, was MP for Dublin City (1836-1837) and for the University of Dublin (1843-1856), and was Permanent Secretary to the Treasury. Mary Comerford, of High Street, who was a tenant of George A. Hamilton, holding a house and garden. Thomas Comerford of George’s Square, who he was a tenant with John Burke of Edward Murphy for a house and garden and another house and yard. John Comerford, of Drogheda Street, who was a tenant of Charles and Thomas Commiskey, cotton manufacturers, holding a house and garden. James Comerford, of Dublin Street, who was a tenant of George A. Hamilton, with a house, office and garden. James Comerford also leased a house and yard to Thomas Wynne as his tenant and was also the owner of three vacant houses in Dublin Street. 1, Thomas Comerford (ca 1836-post 1901), of Quay Street, Balbriggan. 2, James Comerford (ca 1843/1845-post 1911), a ship carpenter living in Balbriggan in 1901 and 1911. 3, John Comerford (ca 1845-post 1911). 4, Michael Comerford (ca 1846-post 1911), a sailor from Balbriggan, who later lived in Queen’s Square and Brunswick Street, Dublin. Thomas Comerford (ca 1836-post 1901), stocking maker, of Quay Street, Balbriggan. He was aged 65 at the 1901 census and living in Quay Street with his wife Mary …, aged 45, from Co Meath. 1, Simon Comerford (ca 1888-post 1911), hosier, aged 13 in 1901, 23 in 1911, and living with his parents. 2, James Comerford (ca 1891/1892-post 1911), hosier, aged 9 in 1901, 18 in 1911, living with his parents. 3, Anne (ca 1895-post 1911), aged 6 in 1901 and 16 in 1911, living with her parents. 4, Patrick Comerford (ca 1901-post 1911), aged 10 and living with his parents in 1911. John Comerford (ca 1845-post 1911), was aged 66 and a “stockener” (hosier), aged 66 in 1911 and living as a boarder in Balbriggan in the house of Mary Keogh, a widow. Michael Comerford (ca 1846-post 1911), sailor, of Queen’s Square North (now Pearse Square) Dublin. He was born ca 1846, and aged 55, living in Queen Square, Dublin, in 1901. He married on 5 February 1868, in Saint Lawrence’s Church, Dublin, Mary Sweetman (aged 47 in 1901), of Alpha Cottages, West Road, born Dublin City, daughter of Laurence and Joan Sweetman (witnesses: Joseph Comerford, Mary Joan Comerford). They lived at 100 Great Brunswick Street (now Pearse Street) (1869, 1876), 133 Great Brunswick Street (1872-1873), Brunswick Street (1878), and 2 Queen’s Square (1882-post 1901). 1, Michael Thomas Alfred Comerford (1869- ), born 1869, baptised in Saint Andrew’s Church, Westland Row, Dublin (sponsors: Joseph Comerford, Mary Woolahan). 2, Martin Henry Comerford (1873-post 1901), born 1873, baptised in Saint Andrew’s (sponsors: James Tyrrell, Margaret Hoelerane); carriage painter, aged 25 in 1901, and living with his parents. 3, Joseph Francis (Francis) Comerford (1876-post 1901), born 1876, baptised in Saint Andrew’s (sponsors: John and Kate McDonald); butcher, aged 23 in 1901 and living with his parents. 4, Mary (1878- ), born 1878, baptised in Saint Andrew’s (sponsors: George Sweetman, Mary Elizabeth Murphy). 5, John Joseph Comerford (1882- ), born 1882, baptised in Saint Andrew’s (sponsors: Patrick Flanagan and Mary Jane Comerford). 6, Henry Laurence Comerford (1883- ), born 1883, baptised in Saint Andrew’s (sponsors: Martin Comerford, Mary Palmer). 7, Julia Josephine (1886-post 1901), born 1886, baptised in Saint Andrew’s (one named sponsor, Mary Comerford); aged 15 in 1901 and living with her parents. 8, Winfred Esther (1887-post 1901), born 1887, baptised in Saint Andrew’s (sponsors: James Hogarty, Katie Carney); aged 12 in 1901 and living with her parents. 9, Edward James Comerford (1888-post 1901), born 1888, baptised in Saint Andrew’s (sponsors: James and Mary Anne McKeone); aged 8 in 1901 and living with his parents. Michael Comerford, Chapel Street, Skerries, Co Dublin, where he was a tenant of James Hans Hamilton for a house and garden. James Hans Hamilton (1810-1863) was MP for Co Dublin (1841-1863), and is commemorated in The Square, Skerries, by a large obelisk, a reduced scale replica of the Wellington Monument in the Phoenix Park, Dublin. Peter Comerford, The Quay, Red Island, Skerries, Co Dublin, where he was the tenant of James H. Hamilton for a house. Simon Comerford (ca 1833/1834-post 1911), a ship carpenter, was born in Skerries ca 1833/1834, and at the age of 74 he was living at 6 The Quay, Skerries, at the time of the 1911 census. Also living at the same address were Joseph Archer (79), a sailor, and his wife Jane Archer (76). Jane Archer was Simon Comerford’s sister, and the Archers, who were married for 56 years, had one child. 1, John Comerford (ca 1871-post 1911), shipwright, of Strand Street, Skerries, Co Dublin. He was born in Skerries ca 1870/1871. He was single and aged 40 at the time of the 1911 census. 2, Anne Comerford (ca 1887–post 1911), of Skerries. She was born in Skerries ca 1886/1887. She was single, aged 24 and living in Skerries with her brother John Comerford during the 1911 census. In addition, Peter Francis Duffe, their 12-year-old nephew, was living with John and Anne Comerford in 1911. He was born in Dublin City. 1, Peter Comerford, of Skerries. 2, Vincent Comerford of Skerries. 3, Robert Comerford of Skerries. 4, Sylvester Comerford, born in Skerries ca 1880. He later emigrated to New York, where he worked as a boot-maker. The Comerford family continued to live in Skerries into the 20th century. 1, John Comerford, who died on 7 June 1932. ● 1a, Charles (Charlie) Dolan (a twin), died 5 January 1973, buried Liverpool. ● 2a, Anne (a twin), married (Dr) John Stanislaus Guinan, MD, of Lumcloon, Co Offaly. He was a nephew of Canon Joseph Guinan, (1863-1932), of Liverpool and Dromod, Co Longford, author of eight novels, including: Priests and People in Doon (1903); The Saggarth Aroon (1906); The Island Parish (1908); The Moores of Glynn (1915); Donal Kenny (1910); The Curate of Kilcloon (1913); and The Patriots (1928). Anne died 24 November 1977, and John died 5 October 2003. They had six children, including John Guinan, who died 29 October 2009. ● 4a, Christopher Dolan (1920-1984). He married Maureen Folan. Christopher died on 1 February 1984; Maureen died on 2 October 1963. History of Balbriggan (http://www.balbriggan.ie/index.php?option=com_content&task=view&id=19&Itemid=30, 26.4.2009); monuments to Hamilton in Saint George’s Church, Balbriggan, Co Dublin. History of Balbriggan (http://www.balbriggan.ie/index.php?option=com_content&task=view&id=19&Itemid=30, 26.4.2009). Belfast News Letter, 11 August 1788. Belfast News Letter, 17 July 1789; 28 June 1793. Jour. Roy. Soc. Ant. Ire. vol 67 (1937), pp 44-45. Balbriggan Harbour, a short history (http://balbrigganharbour.net/history.htm, 26.4.2009). TAB 9/2 (1833), f. 13. PV 9/1, Balrothery, Co Dublin (1852); Burke’s Peerage, various eds, s.v. Holmpatrick; monumental inscriptions, Saint George’s Church, Balbriggan. PV 9/1, Balrothery, Co Dublin (1852). PV 9/1, Holmpatrick, Co Dublin (1852). Letter from Barney Comerford to Patrick Comerford, 15.9.1978. Dr Michael J.S. Egan (ed), Dublin City and County Graveyards, vol 7 (Templeogue, Dublin: Privately published, 1996), p. 88, s.v. Holmpatrick; correspondence with Chris Dolan (27 and 28 September 2010); correspondence with Emma Brennan, great-grand-daughter of Alicia (Comerford) Dolan (27 March 2011); Patrick Comerford, visits to Holmpatrick Churchyard, Skerries, Co Dublin (latest visit, 18 February 2015). Last updated 28 April 2009, 14 May 2009, 17 August 2009, 31 December 2009; 20 April 2010, 29 September 2010; 27 March 2011; 11 April 2013; 26 July 2014; 19 and 21 August 2014; 20 and 21 February 2015. I have come upon your family history and see with interest your family have connections with Skerries going back in time.At the moment Skerries Historical Society is preparing a week end of celebration to coincide with Cencus Day 2011.We are hoping to recreate an image of Skerries as it was in 1911. We are trying to make links between the present and the past: people,photographs,livlihoods,farming,fishing,social norms, buildings,education in fact anything .If you feel you have anything to contribute to our search we would ,needless to say be delighted to hear from you. Thanks Anne. You have left no contact details, but if you contact me through my Facebook page, I'd be delighted to talk about this with you.